The second most use of our iPhone is to click unlimited photos and save memories inside them. Photos capture our beautiful memories that we always keep with us. To make them more interesting a bit of editing is required. 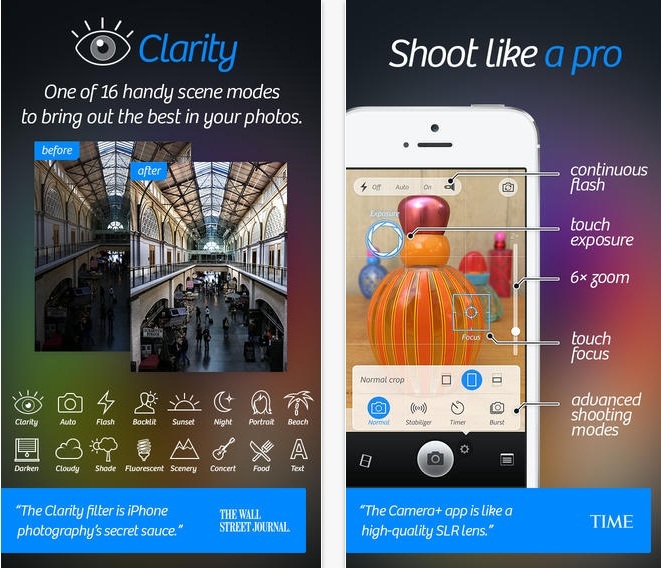 We are presenting a list of Top 9 photography Apps for iOS. Each one is different in their features, cost, ease-of-use and other things. Let us consider them one by one. Adobe Photoshop Express is one of the most popular photography app for iPhone. Adobe Photoshop has always been top favorite app for designers. It is compatible with iPhone, iPad and iPod touch with iOS 7.0 or above. With this app you can create professional looking pictures. Image editing is very easy and more of a fun here. Photoshop Express provides you from basic to high level editing tools. 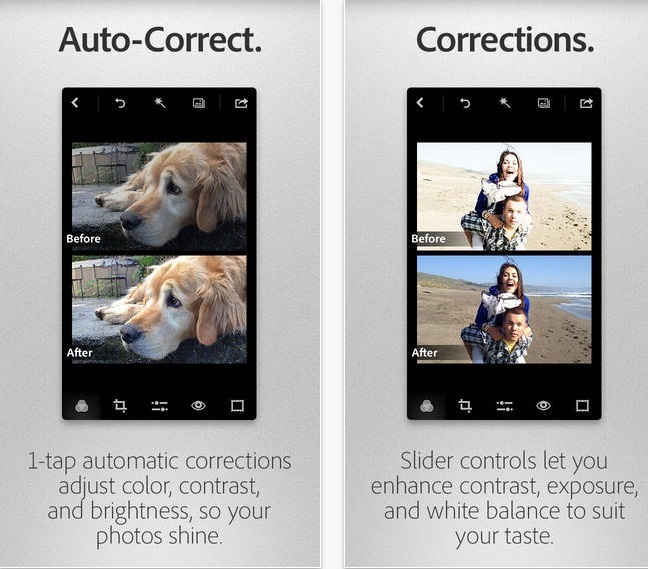 Basic tools include sharpen, blur, adjust brightness & contrast, rotate, straighten, filp rotate etc. 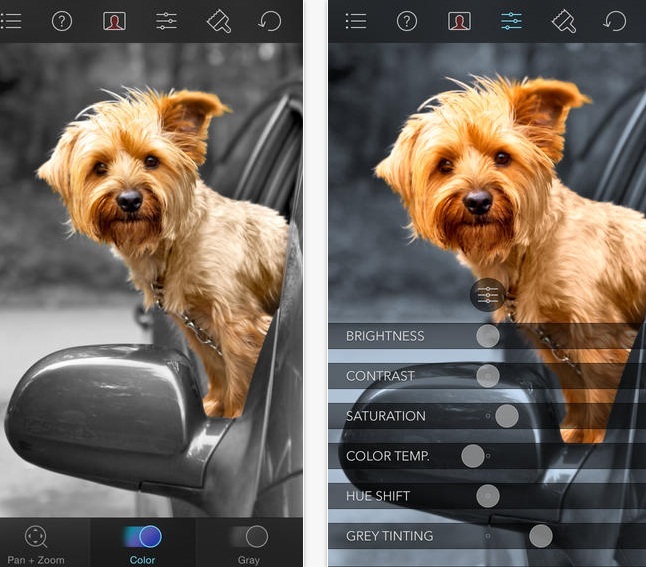 It has one touch Auto-fix option that automatically adjusts your picture for basic things like contrast, exposure and white balance in just one tap. There are more than 20 eye-catching filters and special effects. There are several in-app purchases for noise reduction, to add more looks, effects pack, border pack for more advanced beautiful borders etc. Once you are done with your editing, you can share your image with friends on Facebook , Twitter, Tumblr and more. 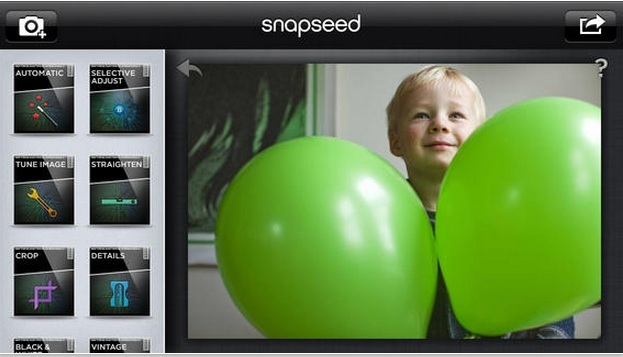 Snapseed is a famous image editing app for both iOS and Android. You can very easily enhance and tranform your picture to a more beautiful one. It also has Auto correct with which the app will do basic adjustment for exposure and contrast in a single tap. It has more innovative filters, explore them. There are a variety of different types of effects to enhance your photo. With its Tune Image feature you can create depth and vibrancy that adapts to color and texture of the photo. There are beautiful and stylish frames and borders to select from. Camera+ makes you love taking photos. You can set exposure serperately from focus and can very easily control light and darkness in your photo. There are various shooting modes, get the sharpest photos you can. It has up to 6x digital zoom. It also provides front flash so, now you can take your own photo in a dark room or in low light place. There are many scene modes to take the best picture in every situation like night, sunset, portrait, beach, food etc. Camera+ has a number of professional photography effects. With this app you can automatically sync you pictures with iCloud. Share your edited lovely photos with your friends on social networks. 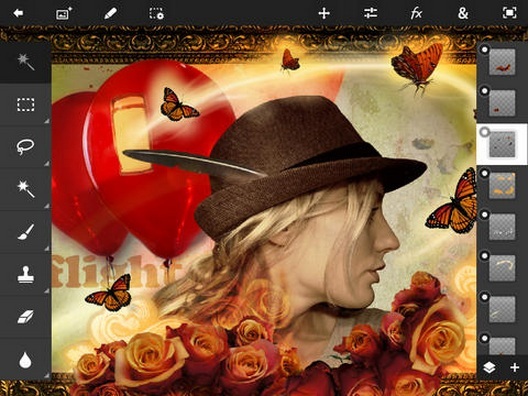 Photoshop touch lets you transform your images using core Adobe Photoshop on Tablets. It compatible on all iPads with iOS 5.0 and above. Photoshop touch makes it very easy to combine different images with applying professional effects. Use layers, selection tools, filters, adjustments and everything you used in Photoshop in your computer. It supports images up to 12MP. With color splash you can give your images a dramatic look by changing its color from black and white while keeping some specific color intact. This draws the viewer’s attention to the color portion. There are many features that makes your editing a fun. It has a resoponsive and multi-touch user interface. There are 4 different brush styles. Share your photos on Facebook, Twitter, Instagram and more. Pixlr-o-matic is developed by the Autodesk who are also the creator of wonderful Pixlr Express for Android. 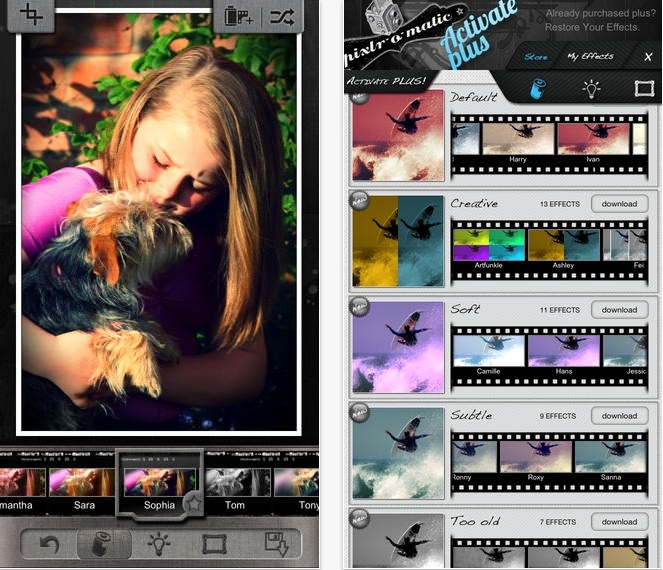 It offers you different filters, effects, overlays and borders to make your picture look perfect. You can amplify the tone of your picture, adjust its mood, apply shades etc. Share your photos directly with your friends on social media. 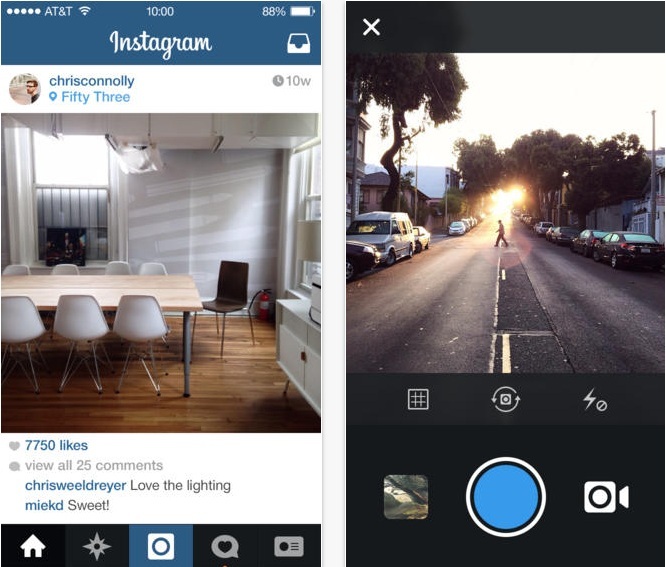 Instagram is one of the most famous app to edit and share photos. It has 100% free design filters. Video recording with breathtaking cinematic stabilization. It has instant sharing to Facebook, Twitter, Flickr, Tumblr and Foursquare. There is no limit on the number of photos you upload. You can like and comment on photos. It has full front and back camera support.